The Telegraph, 13-10-2008 Munda seeks smart use of RTI OUR CORRESPONDENT Ranchi, Oct. 12: At a seminar on the Right to Information Act (RTI) held today, former chief minister Arjun Munda sought judicious use of the information act from the state’s citizens and organisations. The seminar — which was organised by the Jharkhand RTI Forum, a social group working in this sector, and the Junior Chamber International, a social organisation — celebrated three years of the RTI in India. Several officials, including the two information commissioners of the state, Gangotri Kujur and Sristidhar Mahto, attended the event. Before experts and politicians took to the stage, former chief minister released a book on the RTI. The book authored by the director of Media Information and Communication Centre of India, Nandini Sahay, and the centre’s Jharkhand chief, Vishnu Rajgadia, is a guideline to the RTI. The Rs 250-worth book was published by the media centre, Friedrich-Ebert-Stiftung, a German voluntary organisation, and the United Nations Educational, Scientific and Cultural Organisation. “In the past three years several private and public parties have used the RTI for personal gain. But, the act was provided to people to bring in transparency in the system, to empower people to understand their rights better. It failed that task several times as it was not used honestly by the people,” Munda said. 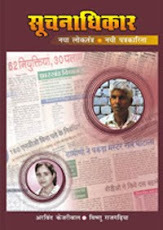 Information commissioner Mahto agreed with Munda and added that RTI was not a tool for “personal vengeance”. At the same time, he asked people to use their RTI rights fearlessly and challenge the legislature and the judiciary, if need be, to get the information that is rightfully theirs. “If you are seeking information even from the state high court and if the latter refuses to do so, you are welcome to knock on the information commission’s door. If the matter reaches me, I will ensure that you get to the information,” Mahto promised. Kujur, on his part, asked NGOs to play an active part and use the RTI as “a tool” to maintain a vigil on the bureaucracy and on the government, to force both to keep transparency in their duties. Social activist Balram asserted that said it was “wrong” to let off persons denying information “lightly”. “A person found guilty of violating the RTI should be dealt strictly, as the act does not allow people to be let off lightly,” he said.